Oysters: Try ‘Em, You’ll Like ‘Em! A long time ago, in a galaxy far, far away, I used to eat lots and lots of oysters. And not just any oysters, but great, big, fresh oysters that were harvested just a few hours or minutes before I bought them. If either of you know the geography of the San Francisco Bay area, at the base of the Point Reyes peninsula, there is a little bay named after Sir Francis Drake. At the end of a long driveway, paved with oyster shells no less, is a place, no more than a few shacks, that used to be called Johnson’s Oyster Farm. Now it goes by a more elegant name, Drakes Bay Family Farms, but the oysters come from the same, incredibly clean, estuary of the Pacific Ocean, just north of San Francisco Bay. I would drive out to the farm along some of the most scenic roads in the Bay area, usually on Saturday mornings, leaving early to miss the worst of the weekend traffic. From the San Rafael Bridge, all the way out to the oyster farm along Sir Francis Drake Boulevard, the physical beauty of the area was astounding. Even on the very common rainy, foggy days, it was hauntingly beautiful. And it all led to something quite special: fresh oysters from one of the most pristine oyster beds in the world. They have gone upscale, but it used to be a casual operation, where you just wandered in and asked for whatever size oyster you felt like. I usually got the mediums or smalls for eating raw. It was an incredible pleasure to eat those briny, sweet gems. 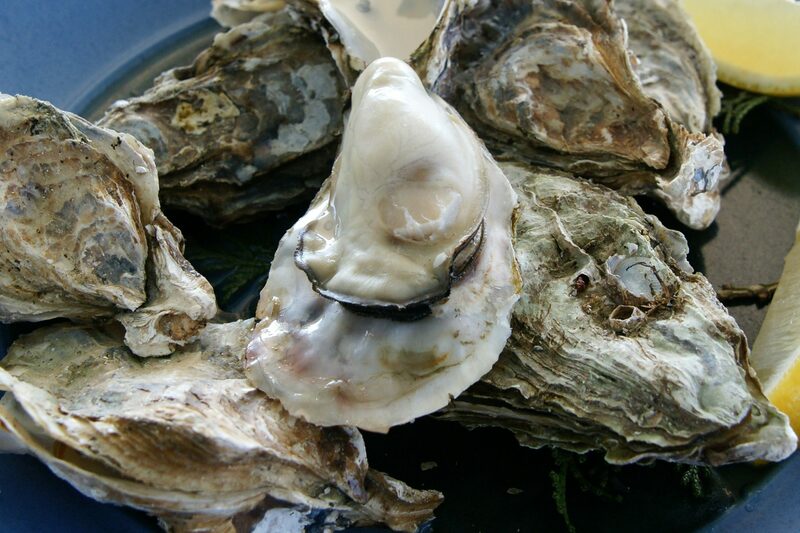 I made the mistake once of getting the extra-large oysters, and it was a challenge to eat even one! They were best consumed by barbecuing or sautéing those monsters. I have had better oysters in my life, but nothing compares to the synergy of a beautiful drive to a beautiful place to buy amazingly fresh, great-tasting oysters. I thought of this because last night I had a simple meal of a dozen excellent oysters with a sort of mignonette sauce (I used cider vinegar). I also lured a prowling 16-year-old with the promise of some Tabasco sauce on an oyster or two. By the way, the contrast is great! The tartness of the mignonette matches the heat of the hot sauce. And with it, I drank a smoky Scotch whiskey. They went very nicely together. But I didn’t fly to California to get these oysters. They were Blue Points from New York, and they were excellent, with a great briny flavor from the liquor and a surprisingly mild and sweet taste from the flesh of the little buggers. And every time I have a Blue Point, I think also of the huge oyster industry in the waters around New York City* that lasted for hundreds of years, until the accumulated pollution of the largest metropolitan area in the country overwhelmed even the amazingly resilient and tough oyster. Hopefully, they will return in my lifetime, but until then, I will resign myself to the awful fate of eating Blue Points from the Great South Bay. Starbucks, You Have Got To Be Kidding! Maybe I’m stupid, but I don’t understand the point of retraining all of your employees in the niceties of customer service and focusing anew on the quality of the product…by locking out all of your customers during a normal business day. I worked for a big corporation for a long time, and our many, many training sessions, seminars, conferences and God knows how many other stupidly named classes never interfered with the job at hand: you know — taking care of the customers! I avoid Starbucks coffee because I don’t like it. It is over-roasted and very plain. But in a pinch it is a convenient place for some pretty good baked goods and hot cocoa for the little brats. But it has to be open for me to spend my money! So, finally, I reveal my San Marzano tomato brand. Or at least one of them.And my dirty little secret is revealed as well; I shop by labels and pretty colors. Everyone knows that wines with nice looking labels taste better! I have simply extended that rule to canned goods. In reality these tomatoes are not San Marzano, in spite of the pretty label. They are grown domestically, and through some technicality, or simple cheating, they are labeled as the famous San Marzano tomatoes from Italy. But they are good quality tomatoes, so why not use them. When I make something that requires the best tomato flavor I shop more carefully and buy the real deal, but for simple tomato sauces and everyday cooking, this stuff is fine. What do you say about a restaurant that does everything well? One of my (many) pet peeves is the lack of professionalism in most, if not all, suburban restaurants and bars. And our dinner (at the bar, of course) last night at the 22-year-old Union Square Cafe highlighted the painful differences between what we in the hinterland accept as service and what real restaurants demand from their employees. From the moment I walked in, I was treated as though I were a regular and excellent customer which I am most decidedly not (well, maybe I am excellent…). And I was wearing a sweater and a pair of not-quite-clean khakis (The dirt was a result of spending a lovely several hours in the bowels of JFK, helping my sister and her life partner track down some stuff they had shipped from Morocco.). My wife, as usual, looked lovely, so maybe they thought I was a charity case and took pity on me. The maitre d’ took my name, told me “30 to 35 minutes,” followed up a few minutes later, and was pleasant and practiced in everything he did. When my wife arrived, he suggested that we have a drink, telling us that the bartender would know that we would be eating at the bar. And she did. And she also made an excellent martini. Yeah, yeah yeah. It’s an easy drink to make. Just try to make one and you will realize that any bartender (bartendress?) who can make a superb martini is far ahead of about 98% of the world’s bartenders. After we sat down, I noticed, happily, that there was plenty of room around each of the bar stools. No cramped and elbow-room-less dining this night! The bartender rapidly set our places and left us with the menus. When she returned, we had several questions about the food, which she answered well and honestly. She actually gave her opinion about the dishes. I was shocked! Oh, one of my other pet peeves is the standard boilerplate that most waiters will spew out when asked about a particular dish. “That’s excellent!” “One of my favorites!” “You can’t go wrong with that choice!” So I followed her advice and got the Pappardelle with Rabbit Ragu, instead of the Black Bean Soup with Sherry (which she said was very good, but nothing special). I love pasta, I love ragu, and I love cheese. And all of these were in abundance on my plate. I was very happy. My wife got some silly salad that was nonetheless very good. One of the challenges of eating in restaurants with my wife is her inability to appreciate red wine. It doesn’t matter how good it is; she will scrunch up her face and look like she is sucking on a lemon when she tastes reds. So joints that offer good wines by the glass are always fun, because I get to taste reds that I wouldn’t drink normally, and she gets her usual Chardonnay (yes, boring, but what can I do?). Union Square Cafe did not disappoint. But what I really liked were the tastes and advice that the bartenders (Victoria and Beth) were happy to supply. They chose well, and we were both happy with our wines. They made us feel as if we were special guests, and that was during an evening when the restaurant was packed, both tables and bar. Our main courses were perfectly executed, but I expected nothing less. I had halibut with some weird (but good) greens that seemed to have been lightly fried, accompanied by beets and sunchokes. The fish was crispy on the outside and tender on the inside. Just what the menu said and just what I wanted. My wife got the Tuna Tartare, but she couldn’t decide which side to have. So the bartender offered to bring her small portions of each. The garlic potato chips were spectacular, and the whipped potatoes with a fried leek garnish weren’t far behind. Even dessert was good, and I’m not a fan of restaurant desserts. And once again, they accommodated us by bringing small portions of two desserts. The little woman likes chocolate chip cookies, and these were certainly good, but nothing out of the ordinary. But the other half was doughnut holes with a lemon curd that was great fun to eat and great tasting too! Union Square Cafe has had 22 years to wear a huge rut in the New York restaurant scene. But the service is as good as ever, the food is excellent, and the restaurant shows no signs of losing the edge that has made it one of New York’s favorite places to eat for so many years. I just wish that Danny Meyer would open a restaurant in my town. This is a tough one. If I were to be objective about every restaurant meal that I have eaten, I could find something wrong with every joint in the world. From unspeakably dirty bathrooms to rancid butter or short-and-curlies in the soup to slightly overdone steak to fois gras with just a bit too much tartness in the fruit sauce — we all could find something wrong with every meal. But the enjoyment of eating at a restaurant shouldn’t be based solely on the quality of the food or the physical plant. I have many happy memories of great times at restaurants, and some of those memories have absolutely nothing to do with the food. In fact, I am sure I can pick through the cobwebs of my mind and find a few meals about which I can’t remember a single thing that I ate or drank, but I still remember them as grand times. Of course, there must be another side to this equation. One such example was a meal that I had at The Water Club, but it was Christmas Day, so the restaurant gets a pass on that particular abomination of a dining experience. Still, just imagine a request for a serving spoon for a bowl of whipped potatoes (the meal was semi family-style) ending with the waiter walking past the table and tossing a spoon into the bowl. The spoon disappeared into the potatoes but not before splashing a few of us with some admittedly excellent spuds. And that wasn’t the worst of it. By far, the most horrific part of the evening was the irritating fact that when the food finally came, it was pretty good! The winner of my unofficial and very personal “Absolute Worst of The Worst” contest has satisfied some stringent requirements. Obviously, the restaurant must be a serious place. I have had plenty of awful meals at diners and greasy spoons and pizza joints, but they are disqualified from the competition because of the unseriousness of the food and the trivial shock to one’s wallet when the meals are less than satisfactory. To be considered for this award, the restaurant must provide some expectation of an excellent meal, excellent service and decor that is a cut above Burger King. I don’t know how to insert a drum roll, so you will have to imagine it. And the winner is… Chez Panisse Cafe. I love taking shots at Alice Waters just as much as the next guy. I think she is a pompous airhead who has never had a rational thought. Her pontificating about “sustainable agriculture” and “cook the season” and the rest of her Berkeley blather does nothing for the state of food in America. It is easy to cook with perfect, organic, new age, zero-footprint ingredients when you are wealthy, well-connected and have producers falling over themselves to be touted by this aging hippie. It’s another thing entirely when you actually have to work for a living and can’t afford $30 lamb and $5 tomatoes. But in addition to being a self-important, affected jerk, she can’t run a restaurant. Or, at the very least, she doesn’t know what consistency means. The reviews of her restaurants are always positive, so obviously she is doing something right. But I have been to both the restaurant and the less formal and less expensive cafe a few times, and the meals ranged from abysmal to excellent (end rant). The perfectly awful evening began with the waiter being snidely critical of our gall. We had the nerve to bring a child to dinner! The child in question was my perfectly behaved nephew, whose manners were infinitely better than those of the the waiter. But he got back at us by spilling a large glass of water onto the table and then didn’t clean it up for a very long time. I won’t bore you with all of the details, but some of the highlights included the following: We had to ask three times for the wine we had ordered; the pizza tasted like someone had spilled cleaning fluid on it; my nephew’s meal was cold; my meal was cold; and my sister’s meal was cold. I tried to attract the attention of the waiters using the usual technique of eye contact. That didn’t work, and neither did the more aggressive method of waving my arm in the air. They would look over and then turn away. Oh, it took 20 minutes to get the check. Actually, this was a great meal. I love remembering the evening, because at some point, it became a farce, and we were amused, rather than angry or irritated. Had it been a conventionally good meal, I would have forgotten it almost immediately. So, thank you Alice Waters for a great time and some great memories. They’re out there, those amazing, and sometimes odd, combinations of foods that are synergistic. I’m not talking about the 17-ingredient sauces that Escoffier touted. Rather, it’s the simple two-part unions that are fascinating and mysterious. They can be as simple as a hot dog with mustard or as expensive as fois gras with fruit. Or what we had last night (which, obviously, is why I thought of the topic), shrimp and canellini beans. “What’s that?” you say. Yes, plain old canellini beans and some sautéed shrimp, with a few San Marzano tomatoes chopped up and tossed in for color. Actually, I simmered the beans in olive oil, white wine and garlic, with a bit of salt and pepper. And we ate this concoction on top of sliced baguette rounds that we toasted just until crisp. So maybe it isn’t a pure one-two punch, but it is a simple combination that works really well. The crunch of the toasted baguette was a nice counterpoint to the creaminess of the beans and the firm sweetness of the shrimp. I added a bit of red pepper flakes (the little woman’s idea) for some zip, but that’s it. No fancy preparations, techniques, or ingredients (hell, the shrimp were frozen! ), and the whole thing took ten minutes to prepare. Okay, so the toast counts as a third ingredient (but that hot dog and mustard combo also has bread), so in reality, my point makes no sense. Some stuff just goes together well. I guess that if I were a classically trained chef who actually understood cooking, I might be able to explain this concept just a little better than I have, but I think you get the idea. As I may have mentioned, I like steak. And pulled pork. And sausage. And roasted beef marrow. And cheese. And butter. Oh, I’ll admit it; I like fat. But as many of us must eventually admit, my waistline and coronary arteries are less enamored than my taste buds of those luscious lipids. Besides, there are foods that taste great but don’t have a gall-bladder-exhausting dose of fat. The default for many people when their doctors say to lose weight and cut out some fat, is fish. And the fish that seems to be one of the most popular, at least judging by what is always front-and-center in the display case and at restaurants, is salmon. But salmon is boring. I ate lots and lots of salmon in my youth. I used to dive for abalone on the North Coast of California, and then trade one or two with the fish mongers at my favorite store. And I would invariably get a big salmon (among other fun stuff) in the transaction. But after eating what seemed like tons of the stuff, it got a bit tedious. However, my bathroom scale has been agitating for a more moderate diet, so last night I dipped my toes into the salmon ocean again. Instead of cooking the same old recipe, I tried to duplicate something that I had eaten at a wonderful restaurant in San Francisco called Aqua. It was a salmon steak, but they skinned and boned it, and cooked it gently in a simple sauce. It was great, and didn’t taste anything like what I expected. Skinning is easy, but I had to pull out a pair of pliers to remove the tiny bones near the spine. I also carefully cut the spine out of the steak, and was left with two halves, which I rolled together to make a round steak about 4 inches in diameter. I put a thin silicone band around it to keep it from falling apart while I cooked it, and then I made a simple marinade of vinegar, honey, mustard, shallots and cayenne pepper. The toughest part was deciding how to cook it. I didn’t want a typical grilled or sautéed steak, but I do like a bit of color. So I split the difference and sautéed it briefly, just enough to brown the flesh a bit, and then popped it into a warm oven for another five or six minutes. It turned out very well. The flesh was moist and tender, and had a delicate flavor that I certainly wouldn’t associate with salmon. Because the steak was uniform, it cooked perfectly, without the overdone parts that I find really unpleasant. The extra few minutes of preparation was definitely worth the trouble. To complete my transformation into a metrosexual, I sautéed snap peas with a bit of lime juice as a dressing. My wife loved them. I wasn’t as happy. Oh well, nobody’s perfect.